Our standard shipping to UK addresses: is 2-3 day, but next working day is available too, if ordered before 11am. Any orders places after that will arrive +1 working day later. When you place an order with Nutshell Natural Paints you agree to accept the following terms and conditions. Nutshell Natural Paints aims to deliver goods of the highest quality. Every effort is made to display only items that are in stock or which can be dispatched to you quickly or direct from the manufacturer. From time to time we may be unable to meet our usual delivery times due to certain items being unavailable, in which case we will advise you immediately. If this does occur, you will be given the opportunity to 1) order an alternative, 2) have the products sent as soon as they become available or 3) to cancel the order. Orders are accepted at the sole discretion of Nutshell Natural Paints and are subject to your credit or account card being authorised for the transaction. All transactions are conducted through a secure web server. We accept Visa and MasterCard via a secure web server. Every effort is taken to ensure that the information contained in this web site is correct and up to date. However, Nutshell Natural Paints disclaims all warranties and representations as to the accuracy of any information contained if at any time it becomes inadvertently out of date or incomplete .Nutshell Natural Paints cannot be held responsible for any loss or damage that may arise from the use of this information. We want you to be totally satisfied with your order. So if you are unhappy with your goods for any reason, you can return unopened, standard stock items, in their original condition, within 14 days of receipt, returned goods may be subject to a handling charge of 25% and you are responsible for all return postage fees. Please note that if your order is returned to us and damaged in transit we cannot credit your returned order. We only stock paints in white and clear, so all non-white paints are mixed to the personalised colour you order, so therefore cannot be returned. The goods should be returned, at your cost, and must arrive in a condition fit for resale for a refund to be made. You must get in contact us via our web form or enquiries@nutshellpaints.co.uk before returning item(s) as we have specific and multiple locations for different stock. Any non-standard stock products cannot be returned unless defective. Any damages must be notified to Nutshell Natural Paints within 24 hours of receipt if a claim is to be made. If you wish to cancel your order for standard shipping it is important that you do so ASAP. Please email enquiries@nutshellpaints.co.uk and request a cancellation. We cannot guarantee your order will be able to be cancelled as orders are often fulfilled and posted within the hour, but we will do our best depending on the status of your order when your email arrives. Where you have requested express or next day delivery, a cancellation instruction must be received within 1 hour of order being placed. 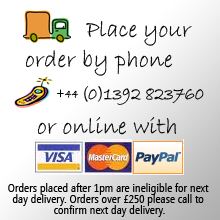 Express delivery offers a next-day service for orders received before 11am. Please note that for both standard and express services, deliveries are only made between Monday and Friday and not at the weekend. Saturday deliveries are possible from £35, please get in contact for pricing. During public holidays and the Christmas period Nutshell Natural Paints will be closed so deliveries may vary, please contact us if your order is urgent. We do not store any card details ourselves. We endeavour to respond to all complaints within three working days. Please email enquiries@nutshellpaints.co.uk . If for any reason we cannot resolve your complaint immediately we will advise you on how long we expect it will take and keep you fully informed throughout the process.